Today is the day that will change Dellarobia Turnbow’s life. She knows this to be the case, although if she tried to tell you why it would change her life, she would be 100% wrong. Dellarobia is hikin up the mountain owned by her husband’s family to meet the man she wants as her lover in a hunting cabin; her children are with her mother-in-law, and she has no intention of coming back. On the way up the mountain in her completely unsuitable shoes, though, Dellarobia sees something that makes the woods appear to be on fire. The experience is so shocking that it sends Dellarobia racing back down the mountain to her family. When the family ventures back up the mountain a short time after the discover that the mountain is awash with monarch butterflies, a phenomenon which brings people from all over the country to their corner of Appalachia. The first 50 pages or so of Flight Behavior are a bit slow as you get to know Dellarobia (incidentally, her odd name IS explained, which I appreciated since we all know how that can distract me). Once the Turnbow family discovers the butterflies, the story picks up immensely. Not only do things begin happening, but these events simultaneous reveal the characters of the Turnbow family and others in their lives and begin to mold and change them. Perhaps most changed are Dellarobia herself and the mother-in-law with whom she has long been at odds. Although the two women are not quite on the path to friendship, their relationship rather quickly becomes less fraught. In addition to being a well-plotted book with great characterization, Flight Behavior also has Something To Say, specifically about the environment. Monarch butterflies do not typically winter in Appalachia, so when this fictional flock does it must be because something is wrong. The thing that is wrong is, specifically, the climate. Changing weather patterns – along with deforestation in their native winter home in Mexico – have stranded the monarchs in the American southeast. Kingsolver is not shy about her message, but it is well-integrated into the book and in the context it makes sense to be blatant about climate change. 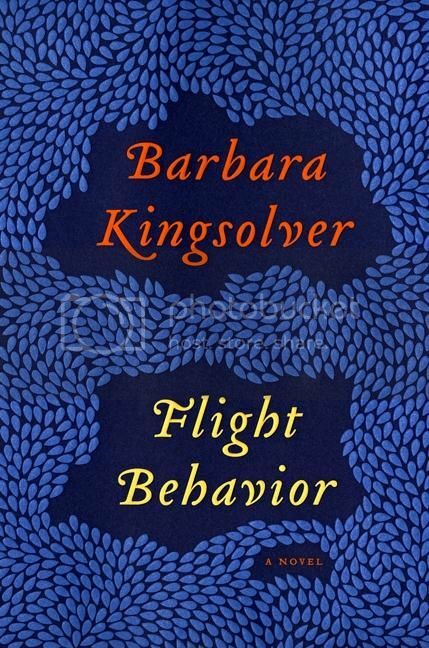 I read Flight Behavior while the East Coast was being buffeted by superstorm Sandy which, with the theme of the disasters of climate change, made for quite the eerie – but meaningful – read. Here was proof of Kingsolver’s thesis being writ large across some of the most populous areas of the country. Although Flight Behavior has an agenda, it is very well integrated into what is a wonderful story with wonderful characters. Highly recommended. I had such a hard time getting into this one. I typically have a 50 page rule (give up after 50 pages and move on), but I stuck with it. I wasn’t as impressed with the characters and writing as you were — I felt it was clunky and wordy in places, but overall it did end up being a good story. I think I would love so many other books if only the authors could manage to pull me in before page 50! I am looking forward to reading this at some point. I will definitely plan to read this one. I loved Poisonwood Bible but find many others who didn’t. This one sounds similar with the pacing. I don’t mind a slow start if I get the payoff in the end. Nice review! I liked this one too. The message was a good one and it didn’t feel (to me) that I was being hit over the head with it. Yeah, objectively I think we were sort of being hit over the head with it, but the message was such an integral part of the story and the story so well developed that it doesn’t feel like it. I was totally uninterested in this book until last night when I heard the author in NPR. Between that and your review, I’ve added it to my Goodreads list!